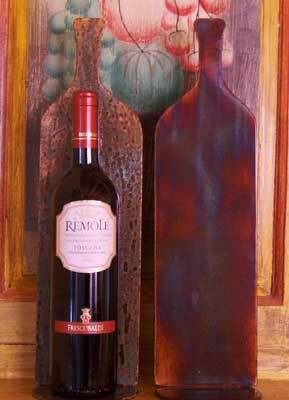 Charming tuscan wine rack is fashioned from steel and finished by our artists. (One bottle wine rack and three bottle racks are shown above in rust.) This is a unique addition to your dining room buffet or kitchen that displays your favorite vintage wines and the bottle that you have yet to finish. Available as a single or a triple and in four gorgeous finishes. Available dressed or undressed. Dressed tuscan wine racks are embellished with your choice of a raffia bow, concho and leather or concho and raffia. These options are available for a $10 charge. Shown above is a single wine rack embellished with a concho and raffia bow. The finish is rustina. Metal wine racks shown below are two singles. The one on the left is in the rustina finish, the one on the right is blue heat. Felt pads are affixed to the bottom of tuscan wine racks to protect your furniture. Here is a photo of the wine rack without embellishments. Order your tuscan wine rack today.